I hate worksheet type classwork but I have some really nice data sets for ecology. Today we looked at the classic Hare/Lynx data and I had the class graph the data set and work together to answer questions about which animal exerts control over the other or, it is both? I then threw in a primary produce (clover) and asked how they would plot a third line for it. They had to consider the lag time for each species in terms of population impact from each limiting factor. In 7th period our web capability went down so I went to a similar data base of wolf/deer interactions, I like this data set because it shows population fluctuations for a controlled island ecosystem and takes into account predation, starvation and offspring. All questions are un-numbered but have the learning objective at the top of each section. Then there are parts to the question below the learning objective. The questions are data driven. Analysis comes from situations, graphs and tables. All questions are short answer. At the end of the quiz period, kids turn in their answer sheets and pick up a rubric and self-assessment. They then look at the rubric and score their own mastery on the self-assessment. Below each mastery scale table, they comment on “What I could do better”. This feedback is really important for their reflection and my understanding of their answer choice. They then turn it all in. I will score each quiz, offering written feedback in areas they did not master. I do this for around 100 honors kids and 23 AP kids. It is a lot of work. But, in my experience the feedback is helpful in determining where the student has to close the gap to mastery. From there, they can reassess. In AP biology we started our evolution domain today. It began with a brief introduction to pre-Darwinian contributions and general idea about natural selection. I then showed the HHMI short film called The Making of a Theory which is very well done. They have a fact or fiction sheet they work on before the film and then after to compare ideas. I will follow this up Wednesday with more intro information on natural selection and its principles. By then the students will have worked with the Grant finch data and see the short film The Beak of the Finch and we can use that to drive the discussion. Today I came across this and thought Google has a great perspective. I just wish I could convince colleagues and our system of the same sentiment. This entry was posted in Uncategorized on August 28, 2014 by Bob Kuhn. This graph below was the object of honors biology wailing and gnashing of teeth last night and today. There were many concerns about not knowing how to do it. But struggle is good and not knowing is better. It does relate to their learning objectives so I did not want the graph to be the focus. The triple Y axis threw them, and many of them pointed out that the mortality should probably be on the Y. So, graphing was the first hurdle. The second hurdle was the idea of graph areas being superimposed such that each abiotic factor reduced the suitable area for the insect larvae to live in with each layer. Temperature was the least harsh factor, but layered with humidity, the suitable area dropped by 60% and then adding light as the third layer, it dropped 80%. In the end you have a small area showing the best conditions for the larvae based on all 3 factors. It was really fun working through it and I can’t say all understood it perfectly, but in terms of the learning objective, they were clear. In AP I reviewed R and R squared in terms of correlation and regression and the kids showed a better understanding. They continued to work on the Salivary Amylase activity and I was able to walk around and help anyone who needed it. The null hypothesis is a concept that they have to work through since it seems to easy of a statement to make. testing the null with critical values is new to them. Working through the Amylase activity, my impression was that they were able to see how scientists can make claims (like # gene copies correlating with amount of amylase in saliva) and it not just be conjecture. I want them to be able to use statistics as a tool and eventually go to it without being asked. Tomorrow we begin our first real domain: evolution. I have never led off with it, but it is my strength so I am looking forward to good times. I probably won’t be able to do Days 164 and 163 due to being off for my mom’s surgery. Does sick leave count for 180 blogging? One of the biggest risks in engaging students more is a decrease in content. It is probably the thing that worries me most coming from a traditional lecture/lab background. On one side, too many activities and labs without content become undirectional and one the other side, too much talking and kids tune out. It is a hard balance for me and so far one thing is clear: I don’t have enough time. If I had 15 more minutes a period, it would be perfect. But, I don’t and I won’t so I have to streamline the content without losing information and get kids asking questions more. Sometimes I feel that kids not asking questions in class is not my fault but the fact that maybe others are not asking them to ask questions to me and each other. By questions, I mean questions that lead to dialogue and conversation about biology, not just a plain answer. I’d love for exploration of a topic and a desire to dig deeper into the system and not just a superficial answer. I am trying to get there but the road is not easy. Today I did not teach well. This week in AP we are doing concept related statistical analysis: chi square, standard deviation, standard error and regression. The biological examples are great and I have to thank the HHMI for that. But, in delivering it I went too fast and was too confusing. I assumed kids knew things they did not. I was excited but they seemed lost. My natural reaction to this is to slow down instead of pushing through. Many of them are confused about what to use when (which is a common confusion even in adults). The idea that these are tools to help them investigate, analyze their data and provide support for claims is a hard one to convey and I hope later, in context it will be more apparent. My goal is to have them select the appropriate metric at the correct time and be able to explain what the metric is helping them do in explaining their data. So, tomorrow we will slow it down and delve more into regression in specific circumstances and how to use it with regard to correlation and strength of support. I will eventually find the balance of content/activity support in honors and I think it will take a little time. I don’t want boring lectures but I also don’t want fluffy non-content activities. This entry was posted in Uncategorized on August 27, 2014 by Bob Kuhn. Today in honors we began our first unit. I have made a commitment to myself that I won’t talk at kids for more than 20 min without an active break. There will be a handful of times where I may have to go more than 20 minutes in a class, but I will have an activity or formative check to break it up. So, today we worked on the first two or five learning objectives for the week. I did start with some content, but transitioned to the ecosystem jars on the tables w/ group questioning and then eventually to a reinforcing activity. I need to work on my closure but I wish I had more time, maybe around 15 minutes. In AP we tackled standard deviation, standard error and variance in context of biological systems. The HHMI AP biology statistics guide is a real gem and it had been very helpful. Tomorrow we will use the HHMI Salivary Amylase activity as a model for these techniques. We will hopefully begin our first domain on Wednesday which is evolution. Wednesday the honors kids will set up the Winogradsky columns which should be pretty fun. This entry was posted in Uncategorized on August 26, 2014 by Bob Kuhn. Today in honors biology we worked on leaving feedback and displaying our posters for the CER model we did earlier in the week. Next week the kids will use the Post-It note feedback to reflect in their journal about whether they could incorporate feedback into their revisions if they were to make them and if not, why? In AP biology we moved into working on Chi Square which is a statistical method used frequently in the course. A short explanation by Paul Andersen about it led to a Q & A about real world applications. The students then did the old M & M chi square activity, looking at bags of the candy in comparison to the Mars company’s proportions. The Chi Square calculation and null hypothesis generation (in particular) stumped kids this past year and this activity did a nice job to rectify that. As an aside, my ecosystem jars ammonia levels rose too much and killed off my animals. I had to do some science today to figure that out and how to remedy that. The shrimp and snails are hardy, but I was at fault in expecting them to suddenly adapt to the small container. I will monitor the water quality for a week and introduce some nitrifying bacteria. I’ll also let the plants modify the ecosystem before adding animals. When I do, the snails will go first and then the shrimp. I may even use smaller shrimp to prepare for a larger respirator. I was not happy about the shrimp and snail deaths but it led to some patient thinking and a revision of the methodology. This entry was posted in Uncategorized on August 22, 2014 by Bob Kuhn. 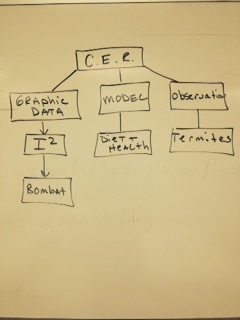 Today I finished working through the concept map I had planned for CER training with the honors kids. I wanted to introduce it slowly and provide them a number of examples in which to apply the CER method. I did graphic data, a model, and an experiment with them and it flowed nicely. Today they worked on the old termite/Bic pen lab. Basically, termites follow specific Bic pen trails on paper. They were to work with claims, collect evidence and then create a reasoning statement. Again, here I gave them the claims but with more time I would have them generate as a group. They had a petri dish with filter paper to write on and a number of different pen types and colors. The claims were that termites were visual and follow lines, they work in groups and pen color does not matter, or they are using pheromones mimicked by the pen and follow that. They worked through an explanation tool but also just used colored dots to chart their ideas. In AP biology students are beginning to work on applying a discovery to a scientific process. We are using the HHMI short film Natural Selection in Humans and the sickle cell/malaria connection to model this. Students will walk through the discovery by Tony Allen in the 1950’s and then apply it to hypotheticals like how global temperature increase might affect incidence of malaria and sickle cell in Africa. Tomorrow they will begin working with statistics in biology. I bought materials yesterday to set up 8 tabletop ecosystems in Mason jars. Each ecosystem has Hornwort, a moss ball, a snail and a shrimp. 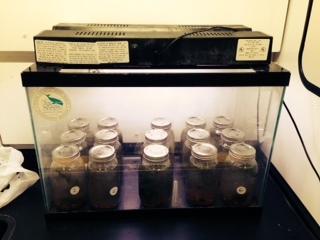 I also have 8 jars with just plants, and two with just water as controls. The goals are long term investigation of the ecosystem in food webs/chains, nutrient cycles, and niche. This was born out of being totally bored with traditional teaching of these things. I am trying to think of small ways to model biology and although it is difficult, things like this are fun and very visual. This entry was posted in Uncategorized on August 21, 2014 by Bob Kuhn. 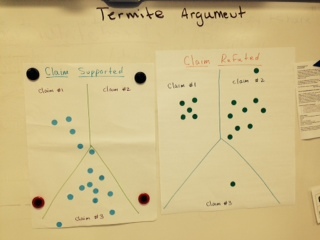 In this activity the students were given 4 claims to evaluate and they did not generate them. This was done only for time purposes and to emphasize the support/refute aspect of the activity. 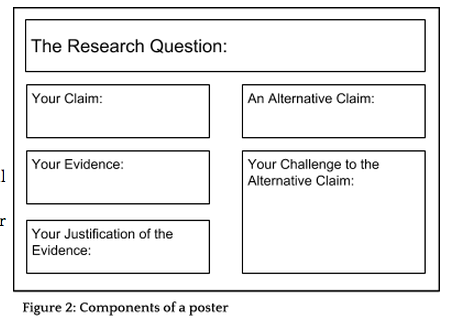 On the left side of the poster they were to support a claim, provide collected evidence and then a reasoning statement below that. On the right, they were to pick a claim to argue against or refute, providing evidence for their challenge. Friday they will post their work and use simple Post-It notes to offer each other feedback on the poster content. We will have a discussion about feedback and what qualifies, since they are not used to this. In AP we wrapped up the Dust Bowl activity with students completing their CER explanation tool and white boarding their claim/evidence/reasoning similar to the poster above, but no counter claim. Again, they will offer each other feedback and then look to revise their work or respond to feedback as they see fit. This year I am also giving the kids more options to express their work. There will be a class grid (below) and discussion about which type of output is applicable for each type of lab or activity. The grid can be edited but I feel this provides a variety of ways for expression. This entry was posted in Uncategorized on August 20, 2014 by Bob Kuhn.